“Father and mother” is the level of the next spiritual degree. That’s why when speaking of them what is being referred to here is the complete annulment of the lower one, annulment of the lower soul before the upper, and engaging with the upper. And here it is written about the father and his wife who is not your mother. Seemingly she is a strange woman to you. But because she belongs to the father and exists on his level, you have no right to engage her, it is the wrong Nukva for you, not the right female aspect that you are able to correct. “Father’s wife” is a desire of a higher degree. That’s why a person who is working with a desire that he is unable to correct damns himself. He skips over a step, and by doing this, he destroys within himself the ability to advance. What is meant by “father,” “mother,” “aunt,” “uncle,” etc. is the next degree on which you become the father with respect to the previous degree. But you have no right to work with a desire of a higher degree than your own, that is, “uncover the corner of your father’s garment.” But when you rise to that degree, then it will be for you. 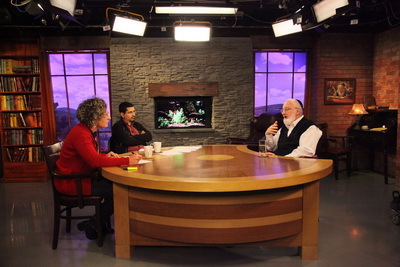 Question: When a son is born, we always say that it is the next spiritual degree. And now it is clear that the father is the next spiritual degree. How is this possible? Answer: The next spiritual degree is not higher than the father because the father continuously rises up and the son rises up after him. There is strict subordination here. The relationship is always maintained: the son rises to the degree of the father and, at the same time, the father rises even higher. 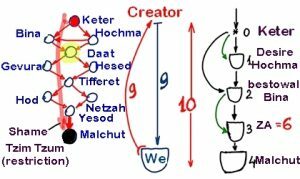 The names of the Sefirot: Keter, Hochma, Bina, Hesed, Gevura, Tifferet, Netzach, Hod, Yesod, and Malchut refer to the inner content of the connections in the creation. Sometimes we meet another Sefira in the plan called Daat. Two directions stem from Keter, Hochma, and Bina, which under the impact of Keter create the Sefira of Daat, which is not included in the ten Sefirot. From Daat stems a separate direction to Hesed and Gevura, which meet in Tifferet. This is how the interaction between the Sefirot takes place. There are many more such connections. Everything in creation is organized and arranged this way: every cell, every atom, every grain of sand, and the whole huge universe are all built according to the one structure of the ten Sefirot. Our egoistic desires are in a black point called Malchut and are the outcome of all the force that impacts us. It makes no difference what level of cooperation the desires are on whether they are on a psychological, physiological, or physical level. On every cosmogenic level in the universe and in all the worlds, the principle is the same—ten Sefirot. Question: In the article “The Last Generation,” Baal HaSulam writes: “The adoption of the law of altruism is based on the love of one’s neighbor in the literal sense.” What does he mean by “in the literal sense”? Answer: It means that everything I think about, dream about, and do, all that arises in thought and desire, comes only from the aspiration to satisfy the neighbor with absolute fulfillment and to do it for the sake of bringing contentment to the Creator. Question: In the corporeal world, does this also take place literally? Answer: I cannot say how it will be realized physically because it depends on how much our world will gradually lose the physical form that we are now experiencing, and will evaporate and turn into purely spiritual matter. This depends on our sensations. The world will become more spiritual in accordance with our spiritual correction, and we will begin to move from physical sensation to the virtual one. Life’s direction is to attain adhesion with Him, strictly to benefit the Creator (Writings of Baal HaSulam, “The Writings of the Last Generation”). Answer: To act for the benefit of the connections between us means to act for the benefit of the Creator. The last generation is just beginning its correction and it wants to change its nature. We started the movement, but practically, we are at the entrance to this state. Question: Don’t you see our generation that lives on Earth in the frame of time? Do you see this in a more general perspective? Answer: I don’t take into account either the Earth or humanity, but only those people who at least somehow aspire to change their nature. Nothing more than that. The last generation starts from the small group of people who understand the goal correctly and want to change themselves. As for our group, we already can almost be called the last generation. We must undergo some more pretty serious tests under the influence of various external and internal stresses in order to get rid of the remnants of egoism (I call them remnants, but they are very big) and firmly decide what exactly this metamorphosis is that we have to undergo. Question: What is the difference between the group that has one foot in the last generation and the group that will already be at the final stage of the last generation? Answer: The nature of the people at the last stage of the last generation will be completely different from our nature. They will no longer be people, but “angels” who are guided and act only according to the desire to bestow, to delight, to be connected with others for the benefit of others, and through them to the Creator. This is a completely different state! Therefore, we are at the very beginning and must decide whether we will change ourselves to become the last generation. Question: From the perspective of nature, which of our actions are considered correct and beneficial and can lead us to a good life so we don’t receive punishment from nature? Answer: All of nature is a closed, integral system, all parts of which—inanimate, vegetative, animate, and human—are bound by the same network. The law of an integral system is that each element influences all others. This means that each particle must sense itself as belonging to the entire system and behave in a way that benefits the entire whole. Not for the benefit of some individual part, and not for its own benefit, but absolutely for the entire system. People don’t understand this law and are unable to reveal it. However, aside from people, all other parts, that is, the inanimate, vegetative, and animate levels of nature, are integrated within this closed system. The entire universe is one integral system. And if we pick any fragment of planet earth and study it, it will be clear that all elements are absolutely interrelated, as if connected by one inner network that is hidden from us and follows a specific program called nature. We can ask, “What is a human being?” A human being is a special case. On the one hand, because of his animal body, he belongs to the animal world. And so it is clear the body must be obligated to be in a specific instinctive connection with the system. But there is also a part in him that belongs to the speaking level because of which he is called human. In this part, it is as if he is disconnected from the system and behaves as if the system does not exist. A person does not instinctively feel the connection and does not feel unity with the web of nature; therefore, he behaves in whatever way he pleases. This “free” form of behavior, without any connection with the system, is called egoism. In his relationship with the system of nature, a human being only considers his immediate benefit. Maybe he will think differently twenty years from now, but that is not important to him because he is only fixated on the stream of momentary experiences of his life that he perceives now. If in this moment he does not possess that which he desires, then he considers it a punishment. And if suddenly he receives what he needs, then he deems it a reward. Naturally, while being disconnected from the general system, these rewards and punishments turn out to be false because a person does not see all that is dependent on his actions and that is why he makes mistakes. He exists within a system, but he is not able to take into consideration all its elements, he doesn’t feel these interdependencies. It turns out that all of his perception of reality is incorrect. Question: If I feel this as reward and punishment, then why should I care that they are false? I received what I wanted, didn’t I? Answer: Then why are people unhappy? If we judge what reward and punishment is only by our immediate experience and act only according to this, attempting to gratify our momentary desires, then we will have to put up with one disappointment after another. If we could always win in this way, then it would be possible to accept this objection. However, we see that we are constantly losing. The further a person advances, the more he has to defend himself as a result of his egoistic relationship to life and his pursuit of immediate gratification. No matter how much we develop society, government, family, sciences, and medicine, we still cannot compensate for the damage and negative reaction of the system to our behavior. Wouldn’t it seem that as we progress in our development we should be able to increasingly understand and sense nature? But it turns out to be the opposite: we progress more and more in our development of our incorrect relationship with nature. We are constantly growing further from nature, from connection to the integral system, and ultimately, we turn into such individualists who are no longer concerned with anything at all, except our own gratification. What has led humanity to cyber wars? How can we cope with an unidentified virtual enemy and where is the world headed from this point?